Point coloration is caused by a temperature-sensitive mutation in the enzyme tyrosinase. Tyrosinase acts as a catalyst for melanin production, which causes darker pigments. This mutation functions normally at cooler temperatures, but not at normal body temperature. The extremities or points of a cat — the ears, nose, paws and tail — are cooler than the body and hence show up darker. Pointed kittens are born white because the womb is warm. They develop the darker points within a week or two of birth. Pointed cats have blue eyes because there's no pigment on the top layer of the iris to block the blue eye color. The blue eye color is gene-linked with pointedness. The blue eyes will sometimes reflect red in pictures taken with flash instead of green/blue like other cats. Blue Belle's gray body color is a genetic impossibility. Blue Belle is clearly a pointed cat, with blue eyes and darker extremities. But point coloration is a form of partial albinism, so her body color should be white, not gray. The development of a gray body color is called shading. 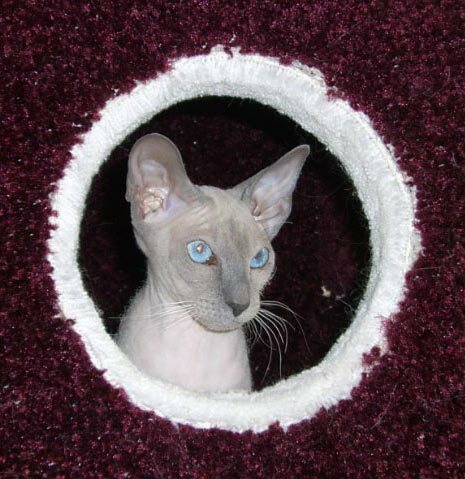 Shading is sometimes seen in older Siamese cats, but never in Peterbald cats. Blue Belle's gray body color is temperature sensitive, suggesting that it is related to the tyrosinase enzyme. When Blue Belle lies on a heating pad for too long, her gray belly turns white. If we raise our home's temperature high enough, her body and point color becomes a lighter shade of gray. Curiously, if we take Blue Belle's picture with flash photography, her body color sometimes appears white in the pictures. This seems to depend on the angle of her body relative to the camera. There are several possible causes of Blue Belle's gray body color characteristic. One possibility is the colder body temperature of a hairless cat causes the tyrosinase enzyme to be active in the body. This seems unlikely because Blue Belle's coloration is unique among Peterbald cats, her body temperature is normal for a Peterbald cat and she maintains her gray body color even at room temperature. Another possibility is that Blue Belle carries a spotting gene and has a single large gray spot that covers most of her body. This seems unlikely, given that her body color is temperature sensitive. But perhaps her coloration is akin to a mink pattern. Another possibility is an additional or different mutation in the tyrosinase enzyme that allows it to be active at warmer temperatures. Blue Belle's parents were a solid blue sire and a lilac point dam. Copyright © 2010-2016 by Mark Kantrowitz. All rights reserved.